If you look up prices of insulators while at your computer, this for you! This contains all the listings in the hard copy Price Guide. You can select from the primary CD style category you want to look items up in (Battery Rests, Threaded, Threadless, Spools & Misc, and Special Issue insulators.). Then, with a couple of clicks with the mouse, you can find your item! This also contains the full section on Special Issue insulators with includes commemoratives, private issue insulators and more from the hard copy price guide is included in this version. 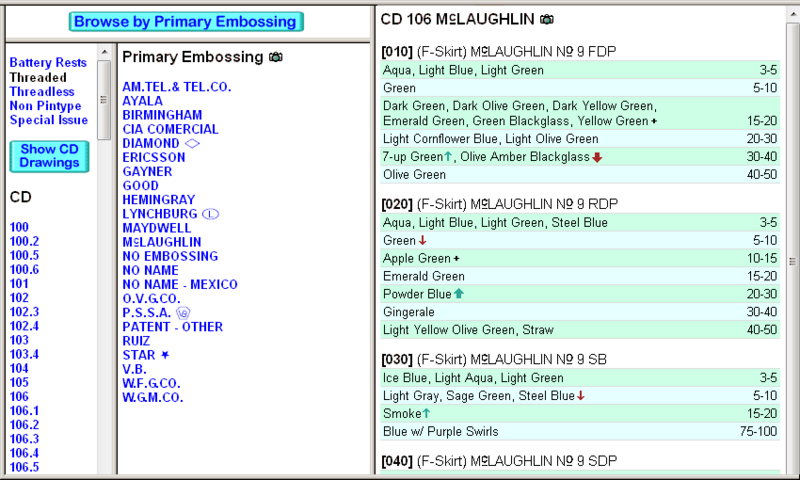 A unique feature is that you can also browse by Primary Embossing. Forget all the CD numbers Lynchburg's come in? Well, in Primary Embossing mode, you select Lynchburg first, and then are presented with only the CD's that are appropriate for that Primary Embossing. For full information, visit the Insulator Price Guide Browser web site and be sure to take a look at the demo!